My husband and I are pretty big football fans. I like nothing more than lying on the couch Sunday afternoon watching a good game and knocking back some healthy (and some not-so-healthy) game food. Which is why I was so excited last July when Jackbird asked, out of the blue, when football season started. I was thrilled that maybe he was ready to start really watching the games, so I told him it would just be a few more weeks but that I was happy he liked football. "Oh," he said, "I just like the hummus. We get to eat hummus during the games." So much for my star athlete. 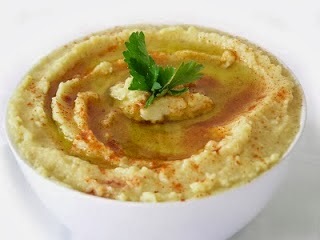 This weekend, for the game, we'll be making this simple hummus. In a blender (or food processor) combine all the ingredients except the parsley & paprika. Blend on low speed until smooth. If you're using the blender, you'll have to stop and push down the ingredients from time to time. Scrape the hummus onto a plate. Drizzle lightly with olive oil and garnish with paprika & parsley. You can make it several hours before serving it. Just cover with plastic wrap and leave at room temperature. I usually serve it with pita chips or veggie chips.